Ehime Prefecture (愛媛県, Ehime-ken) is a prefecture in the Shikoku region of Japan on the island of Shikoku. The capital city is Matsuyama. Until the Meiji Restoration, Ehime prefecture was known as Iyo Province. The name Ehime comes from the Kojiki. It means "beautiful maiden." After the Battle of Sekigahara, the Tokugawa shogun gave the area to his allies. Kato Yoshiaki built Matsuyama Castle which became the center of the modern city of Matsuyama. Drought is common in Ehime history. Ehime faces the Seto Inland Sea in the southwestern part of Shikoku. 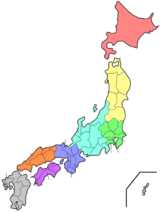 The prefecture is bordered by Kagawa Prefecture and Tokushima Prefecture in the east. Kōchi is to the south. The prefecture has a long coastline and it includes many islands. The Yanase Dam was built in 1953. National Parks are established in about 7% of the total land area of the prefecture. ↑ Nussbaum, Louis-Frédéric. (2002). "Ehime" in Japan Encyclopedia, p. 170; Japan External Trade Organization(JETRO), Ehime Prefecture, Regional Information; retrieved 2012-4-6. ↑ 2.0 2.1 Nussbaum, "Matsuyama" at p. 621. This page was last changed on 31 August 2017, at 00:54.